Sheikh Mohammed Bin Rashid Al Maktoum presents the Local Sports Figure award to Princess Haya at the seventh edition of the Creative Sports Awards. 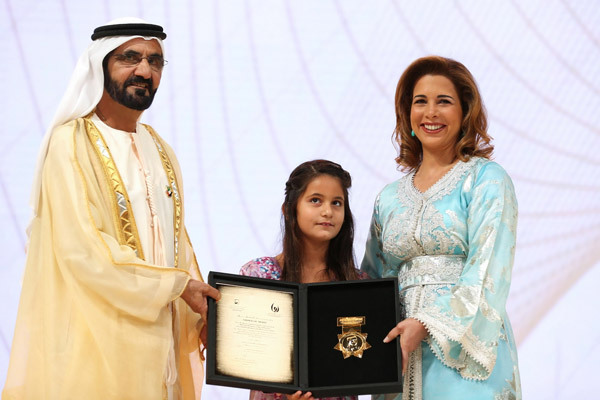 FEI honorary president Princess Haya Bint Al Hussein has been recognised for her work with the organisation at an awards ceremony in Dubai. A total of 180 entries were received for the seventh edition of the annual Mohammed Bin Rashid Al Maktoum Creative Sports Awards, part of UAE prime minister’s Global Initiatives focusing on humanitarian, social and developmental strategies. Princess Haya received the Local Sports Figure award in recognition of her work as FEI President during 2006 to 2014, and for establishing the FEI’s global sport development programme, FEI Solidarity. FEI Second Vice-President Sheikh Khalid Bin Abdulla Al Khalifa was also honoured in the awards, receiving the Arab Administrator Award – Kingdom of Bahrain. Sheikh Khalid is also a member of the FEI Executive Board and President of FEI Regional Group VII. Sheikh Mohammed Bin Rashid Al Maktoum presents the Arab Administrator Award to Sheikh Khalid Bin Abdulla Al Khalifa of Bahrain. FEI Solidarity, launched in 2011 and inspired by the Olympic Solidarity model, is focused on providing opportunities for the next generation of athletes and all those working in equestrian communities around the world, so that local structures can be established to develop the sport. “For the FEI, it is particularly gratifying to see FEI Solidarity recognised in the award to our Honorary President Princess Haya, and to see our 2nd Vice-President Sheikh Khalid honoured. It is good to see their services and commitment to equestrian sport getting this recognition,” said Ingmar De Vos, FEI President and FEI Solidarity Chair. The FEI was not the only international federation to be recognised at the awards ceremony. The International Judo Federation, also with a base in the Olympic capital of Lausanne, was presented with the International Organisation Award for its efforts in bringing judo and its values to children in Syrian refugee camps.